I convinced my mom to buy playsilks for Abigail's birthday in January. She was apprehensive about it, not sure if Abigail would even be interested in them. I was too, but I really wanted to give them a shot. Playsilks can be expensive, so I decided to try dying some myself. I ordered an assortment of sizes from Dharma Trading Company. I was impressed with Dharma Trading's promptness. The website states that orders placed before 11am are shipped same day, and orders placed after 11am are shipped on the next business day. I ordered late on a Friday afternoon, and received them in Monday's mail. I wouldn't expect that kind of promptness every time, but thought it was awesome to get my order before I thought it had shipped! I ordered eight scarves in varying sizes. Six of the scarves are the Haboti 8mm silk, which I think I prefer. I also ordered one crepe de chine 12 mm and one flat crepe 8mm, just to see the difference. They're both nice, but I think the Haboti is suitable for playsilk purposes. If I had to do it again, I would get more of the squares (25x25, 30x30 and 35x35) and less of the longer scarves. Now that I've watched her play with them for a while, I know the the very small rectangles don't work as well. She does like to wrap the long narrow ones around her head or her body (or my head and body). I've seen lots of post about dying playsilks all over the web, but they all seem to reference the tutorial I used from Sara's Toy Box. I adapted the directions a little. I'd read that her directions created very intense colors, and I wanted a lighter color. So instead of using 3 packets of Kool-Aid, I only used 2. I'm thinking now that was a mistake, because the colors aren't really muted. Instead I have more of a tie-dye affect, which is NOT what I was going for. Hopefully, it will all be ok, and they'll look more realistic. For yellow, I used lemonade, pink was pink lemonade, and blue was blue moon berry. I didn't have a lot of Kool-Aid in the house, so for green, I used some Wilton gel food coloring that I had. The green was the least colorfast, though, so I ended up redying using lemon-lime (I'll show those photos another time along with the rest of the silks). The reasoning behind using Kool-Aid is that because it is food grade, it is non-toxic. A lot of the blogs I've read indicated that that either the blogger didn't grow up with Kool-Aid, didn't like Kool-Aid or will never drink it again after seeing the technicolor effects of the dye. I did grow up with Kool-Aid, and don't have a problem with it. I also am familiar with food grade dyes because my mom has baked and decorated cakes for nearly my whole life. I grew up with decorated cakes on lots of occasions, and I don't believe I had any ill-effects from the occasional food coloring (this includes the copious amounts of Kool-Aid I drank growing up). I guess I'm just not in the camp that doesn't like about food coloring. 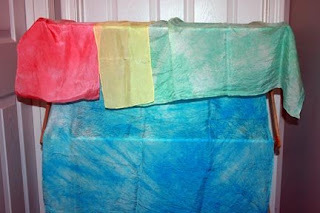 I think it's ok in moderation, and it doesn't bother me that I can use it to dye fabric. Natural dyes are food substances too but no one is concerned that blueberries will turn your insides blue! Another difference between my method and that of the tutorial is that I'd already started when I realized I had no white vinegar in the house. My driveway was still covered in ice from an ice storm that had hit earlier in the week so I had no desire to go get any. Instead I used the apple cider vinegar that I happened to have. I DO NOT like vinegar. I spent the whole day wrinkling my nose and hoping that vinegar really is good for clearing up odors. Then hubby got home, and his nose wrinkled too. I was able to use white vinegar when I dyed the rest of the silks and it seemed to work the same, but didn't have the strong smell when cooked. It still took forever to get the smell out of the house! Abigail was excited about the silks from the time I took them out of the package. She grabbed them and ran off as soon as I opened the envelope. She didn't seem as excited about them at her party, but she's been playing with them for months now. She calls them her "scarves" and wraps herself in them. She likes to put them over her head to block out light at naptime, too. Playsilks seem to be a good gift for any age child. A younger child would enjoy them just because of the texture and bright colors, and they make wonderful light summer blankets. Your playsilks turned out lovely. My kids love them. They are light enough for a tiny baby to manipulate but are still interesting to my nearly seven year old. Our silks get loved ragged around here. Perhaps I'll take up dying my own sometime soon. I hope you guys enjoy the playsilks. We have had many hours of fun with ours and they have been used in many creative ways.